African Water Log: Greetings from West Africa! The rainy season is slowly arriving in Burkina Faso. In the eastern part of the country, farmers have begun planting the traditional crop of millet. There has been some rain here in Ouagadougou during April and May, but not enough to plant crops. Everyone is hoping the rainy season will begin soon. This is also a time of change for our family. After nine months of French classes, we will be returning to the states to visit friends and relatives and prepare for our deployment to the Central African Republic. Regrettably the security situation in that country is not good. 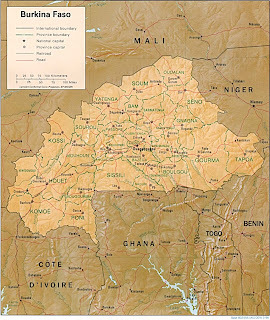 So the decision has been made that we will be living Garoua Boulaï, Cameroon, instead of Baboua, CAR. The two towns are only separated by 20 miles of dirt road and the border, so Joe will travel to the CAR to work when conditions are good.